There are many pallet scales for sale, but finding the right one for your lab, farm or manufacturing plant can be a very tedious project. The pallet scale is going to be used on a constant basis for incoming and outgoing shipments. You need the best scale on the market, and you can’t waste time mulling over every option. If you are having a hard time finding the right scale, then read this article and find out what factors you should consider before buying a pallet scale. Pallet scales come in a wide variety of different platform sizes, but you need to choose the right one for your business. Choosing the wrong platform size can make it very difficult if you need to weigh larger pallets, and it can even lead to problems on the work floor. For example, the pallet may fall off and the contents can break, or the pallet may even fall on an employee. The basic rule when buying a pallet scale is to get a platform that will accommodate your largest pallets. This allows you to weigh the largest pallets without any safety concerns, and the scale will easily accommodate your smaller pallets. All pallet scales for sale have a set weight capacity. These scales cannot weigh something that is above the capacity, and very heavy pallets may actually damage or warp the scale. Getting a scale with a capacity of 10,000 pounds, which is the industry standard, will be fine for most businesses. At the same time, this will be useless if your pallets usually weigh more than 10,000 pounds. Consider how much your average pallets weigh, and get a scale that will accommodate the weight. 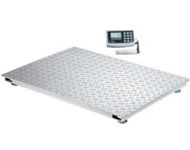 You can typically special order pallet scales that have above average weight capacities. Superior manufacturers like us can make scales that weigh pallets that are 20,000 pounds or more upon request. Load cells are responsible for weighing the pallet, but they must be very durable for an industrial setting. It doesn’t matter how careful a driver is with his pallets, there are times when the driver will accidentally knock into the scale. There may also be times when the pallet drops much faster than anticipated. This puts a lot of extra pressure on the load cells. Fragile load cells can instantly break from a small mistake like this. Most industrial settings encounter this problem on a daily basis, and having such a fragile pallet scale can mean a lot of downtime for your business. It is best to get a pallet scale that has durable load cells. These load cells can withstand the rapid increase in load, and they are less likely to give out as time goes on. This means that the scale lasts longer, and there is a much smaller chance of accidents causing the scale to break. You will usually get better durability if you choose load cells made from stainless steel. This is also more water-resistant than tool steel and nickel, most commonly used for load cells. The majority of business owners don’t consider the coating material used on pallet scale platforms. This may seem a little superfluous, but the coating is actually very important when it comes to your scale’s longevity. The majority of pallet scales for sale use a powder or enamel paint coating. These coating materials are inferior, and will lead to major durability problems later in the scale’s life. Pallet scales have heavy pallets dropped on them many times throughout the day. All of this movement and load will eventually cause the platform to scratch. If the coating is inferior, then this will cause cracks in the platform that reach deeply into the scale. If any moisture gets into these cracks, then the scale will rust. That can take years off the scale’s longevity, and it can cause your business to waste thousands of dollars. It is better to get a scale with an epoxy finish that is supplemented with zinc. This finish is much more rugged than powder and enamel finishes, and it will keep your pallet scale rust-free for many years. This material is less likely to scratch, and the zinc will help keep the rust away. Most industries will not need a pallet scale that can resist strong chemicals and acids, but there are a number of labs and manufacturers that may require a scale that can withstand these harsh chemicals. If you have ever put acid on a regular pallet scale, then you know just how disastrous this can be. Your average pallet scale is not made to withstand harsh chemicals, and the steel can warp, crack or wear away very quickly. This can render the scale almost useless in a matter of minutes, and it makes it difficult to weigh other pallets. If you commonly encounter strong chemicals, then you need a pallet scale that can withstand them. These scales are modestly higher in price, but the extra cost will keep them alive for a much longer time. A good pallet scale needs an LCD indicator. These indicators show you how much the pallet weighs, and it allows the operator to change between pounds and kilograms. These displays commonly come with a feature that allows operators to subtract the weight of the container to get the real weight of the pallet. LCD screens are also much easier to read than any other screens. The large numbers will be easy to see, and the display will efficiently tell operators exactly how much the pallet weighs. If you want accurate readings, then an LCD screen is the best way to get them. We have the best industrial pallet scales for sale, and we have or can build a scale to fill every possible need. If you want to get a pallet scale that will last for years, then check our products online to see what superior craftsmanship can do for your business. We have been selling industrial scales for years, and we know how to make a scale that will benefit any industry.